Astrom Editions AB - Copper Production and Divine Protection. Copper Production and Divine Protection. 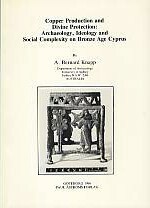 Av A. Bernard Knapp. 164 sidor. ISBN: 978-91-86098-44-5.